Bobby Reis is one of the true “utility” players of the 1930s. Reis began his career as an infielder, spent a couple of years in the outfield, and then, when things didn’t work out as Reis might have liked, his managers recognized that his strong throwing arm meant he might be able to help as a pitcher – so he did that, too. 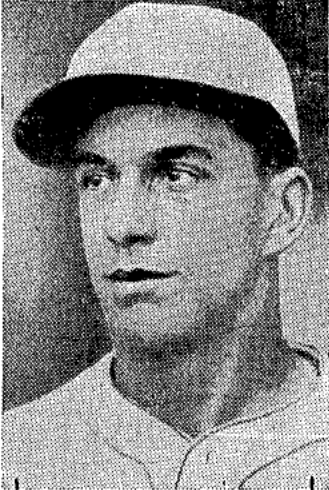 A 1934 image of Reis in The Sporting News. More importantly, though, his batting came back. Reis hit .323 with 31 doubles, 14 triples, and 10 homers for the 1933 campaign, and continued to club the ball in 1934, hitting .297 with 56 more extra-base hits. Reis was a run producer, too – in 1934, Reis scored 90 runs while driving in 89 more runs. “The what-is-it has had a most peculiar existance since he entered professional ball. He started life as a shortstop and a third baseman, gave that up because his handling of ground balls was too erratic. At Toledo, he shifted to the outfield where he was a fielding sensation. But his experience at bat last season as a Brooklyn utility outfielder seemed to impress upon him his futility against big league pitching. “Having a naturally strong throwing arm, Reis decided to become a pitcher. His ability to make Brooklyn regulars look rather foolish in batting practice convinced Stengel that he had a chance. St. Paul suited Reis, though, and he stayed in the city – active in baseball alumni events – until was called to the final field on May 1, 1973. (1) “Bobby Reis is Home town Boy who is Making Good with Detroit Club”, Cameron, Stuart, Nevada State Journal, 3/27/1932, Pg. 7. (2) Connors, R.J., “Minors Worth Watching”, The Sporting News, 8/13/1931, Pg.3. (3) “Jack of All Trades”, The Sporting News, 12/13/1934, Pg. 1. (4) “Brandt Gives Casey More Elbow Room”, The Sporting News, 12/19/1935, Pg. 1. (5) “Brooklyn Tosses Out Brandt’s 1935 Figures”, The Sporting News, 1/2/1936, Pg 1. (6) “20 Pitchers ‘Pour’ at Bees Big Party”, The Sporting News, 3/4/1937, Pg. 1. (7) “Pitching Pegs St. Paul High in A.A. Race Again”, The Sporting News, 1/26/1939. (8) “Many of ’39 Saints Ready to Take Wing”, The Sporting News. (10) “Springfielders Hand Tigers First Defeat”, Runn, Hittan, Albert Lea Evening Tribune, 7/27/1945 Pg. 6.